Let Sage 50c supercharge your business with in-depth and time-saving solutions to manage your cash-flow, invoicing, taxes, inventory, and much more. Our newest version seamlessly combines the power and productivity of a trusted desktop solution with secure online access. FREE! 1 hour free training in Sage 50c Intelligence Reporting is included with every purchase of Sage 50c Premium Accounting from Computerized Business Associates. A Certified Sage Intelligence Consultant from CBA will teach you to create your own reports, customized to your specific business needs, using this expert Business Intelligence reporting tool. Sage 50c Premium Accounting enables you to save time and money by making simple tasks more productive and efficient. It gives you the tools and information you need to make successful business decisions. Sage 50c Premium gives you insights that other accounting programs don't. Generate more money: The tools included in Sage 50c Premium Accounting let you be more profitable. With extensive control over your inventory, job phases and their costs, purchasing and invoicing, and more, you can identify what works and what doesn't. Better insights for better decisions: Using your company's real-time data and the familiar platform, Microsoft Excel, the Sage 50c Intelligence Reporting feature lets you make fast, informed business decisions with confidence. Sage and Microsoft are partnering to create the only accounting solution with anywhere, anytime integration with Microsoft Office 365 and cloud access to give businesses more flexibility and freedom in how they work. Sage 50c with Office 365 now enables our customers to seamlessly manage their business and office accounting needs in one robust solution. Sage Contact � Automated sync of Sage 50c contacts and Outlook contacts, you never have to spend time manually adding contacts. Automatic Cloud Back-Up - Get the peace of mind and security knowing your data is safely backed up in the cloud. Microsoft Office Business Premium � Gain cloud access to all the core Microsoft Office 365 program suite including OneDrive, Skype and much more! This user-friendly business accounting software, Sage 50c Premium Accounting includes module-level security for up to 5 users. Advanced user security controls, an Internal Accounting Review tool, and tracking audit trails, give you confidence in the security and integrity of your data. You'll always have control over who can access your information, because it's installed locally on your computer or network. Got inventory? 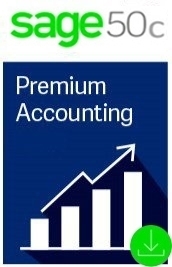 Sage 50c's Premium Accounting has you covered. Multiple inventory modules let you manage every aspect of inventory control, including assemblies and assembly costs, purchasing, and stock on hand. Always know what you have on hand, and never over order again. Customize the content of Sage 50c generated emails. More powerful and customizable lists. As long as your Sage Business Care subscription3 is current, you'll get free automatic software updates and improvements to your Sage 50c software. With Sage 50c Intelligence Reporting at your fingertips, you can harness your data efficiently and effectively. You'll get insights into your business for better decision making. These benefits and more are included with your auto-renewing Sage Business Care plan that comes with your Sage 50c software purchase!